The purpose of the annual Revolve Eco-Rally, this year sponsored by tyre maker Bridgestone, is to highlight greener transport options. 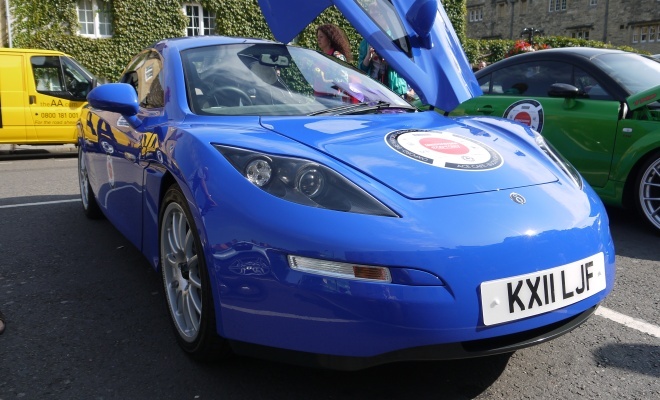 The breadth of this year’s event was vast: entrants ranging from a huge diesel lorry part powered by liquefied natural gas, though to svelte electric sports cars like the Lightning GT and Delta E-4. 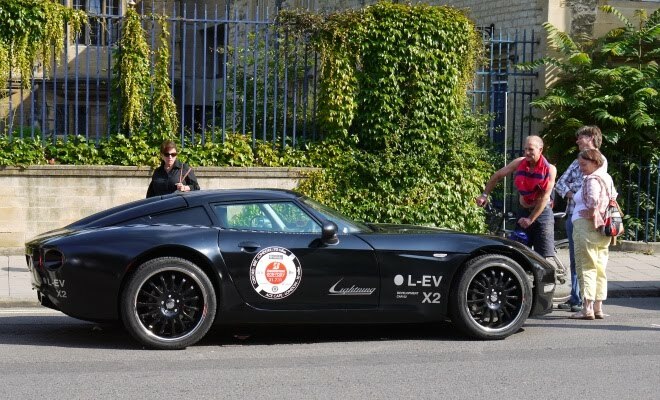 Running between Oxford and London, with a side-route for short-range vehicles departing from the Ace Café, the rally provided a striking snapshot of the cleantech revolution that’s sweeping the automotive sector. This year was the fifth event, the second I’ve gone along to, and the first I’ve actually participated in. 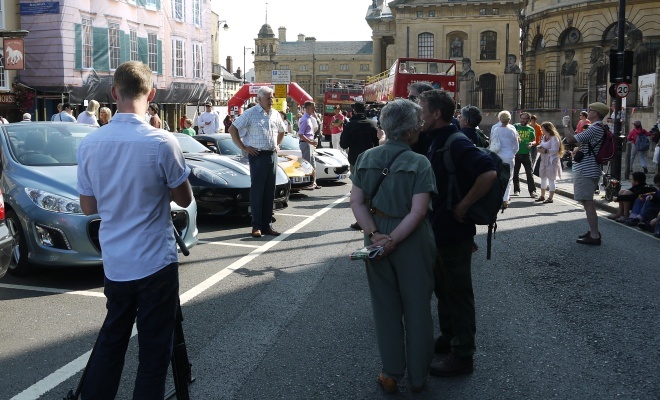 My Eco-Rally started on the morning before the run, in the shape of a text from a friend at Start – a sustainability charity started by the Prince of Wales. 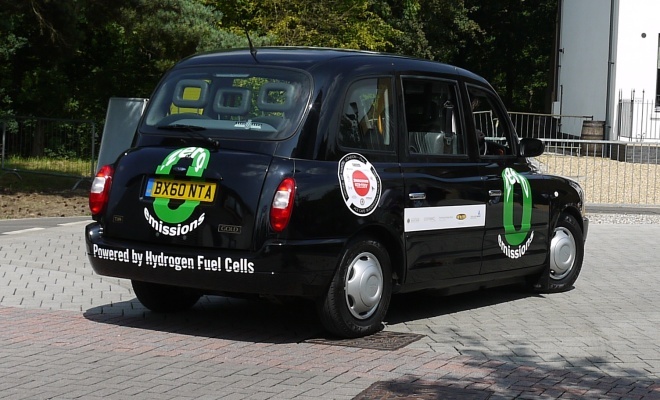 Start promotes the Eco-Rally and can also pull the strings needed to commandeer The Mall (the broad boulevard that runs from Buckingham Palace to Admiralty Arch) which provides the London destination for the rally. Would I like to drive one of the cars, my friend John’s text inquired. I swallowed my pride – knowing that first, second and probably third choice drivers must have ducked out – and replied that I’d be delighted. So that was my Sunday morning beauty sleep ruined – my train to the Oxford startline departing at a larklike 8:03am. Ninety minutes later I hooked up with John and cohort Michael from Start on Oxford’s Broad Street, where the diverse range of green vehicles sat twinkling in bright morning sunshine. 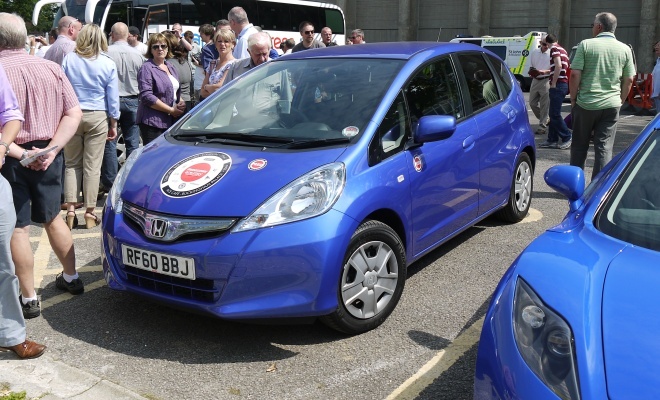 I quickly established that I’d be driving a Honda Jazz Hybrid for the first leg, which would take us as far as the BRE Innovation Park near Watford. After that, the plan went a bit hazy. Guest drivers would swap vehicles. There’d be something else interesting to drive, or to be driven in. Probably. In the meantime, there were slightly more pressing issues. Who had the key to the Jazz? Did anyone know the postcode for our destination? And exactly what time were we due to leave? Eventually, somewhat behind a vague schedule, the convoy got under way, with me piloting the Jazz, chauffeuring Michael and John. 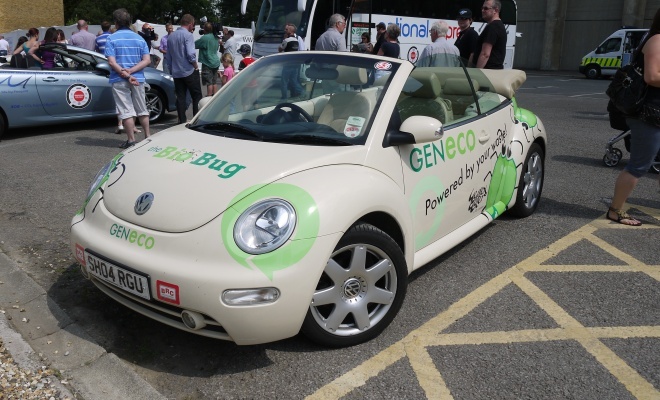 Up ahead was the so-called Bio-Bug (affectionately known as the Dung Beetle) – a modern VW cabrio powered by methane, captured from a sewage treatment plant. Fortunately it didn’t leave a brown, whiffy cloud in its wake. 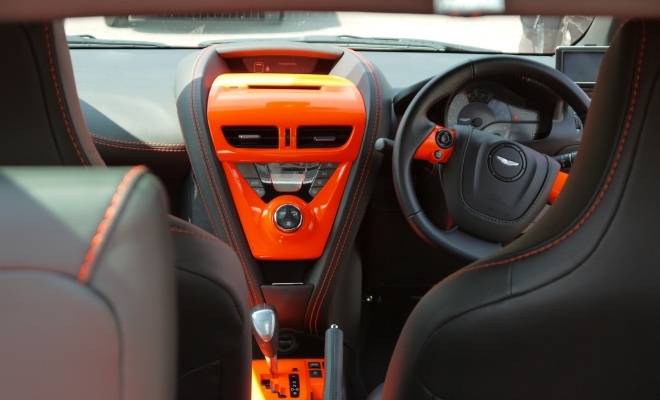 In my rear view mirror, a trio of perky Aston Martin Cygnets jostled with each other. There were some works Aston drivers back there in the little city cars, apparently, with itchy feet. 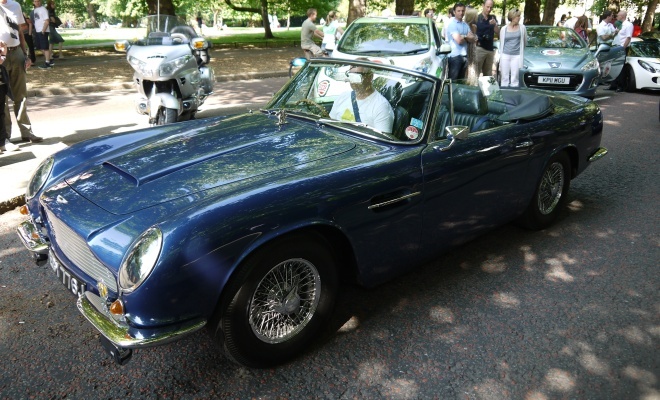 As soon as we cleared the choked city centre and hit dual carriageway, the Astons were off, pedals to metal to the sound of screaming Toyota fours. Clearly they’d focused on the Rally part of the event rather than the Eco bit. Thoughts of which reminded me that I ought to take note of the fuel consumption of the Jazz Hybrid. Flipping through the dashboard info options I found the eco meter. And then I flipped back a page. Did that screen just say what I thought it said? Yes. Range to empty an alarmingly small number. My eyes slid over to the fuel gauge for the first time, to find the needle resting firmly on zero, next to a gently glowing orange petrol pump symbol. Cue an impromptu stop at M40 services, and all-round relief that I’d noticed the vaporous reserves before we’d actually spluttered to a halt. It hadn’t occurred to anyone on board that we might have been handed the keys to a car with no fuel. Having slipped to the back of the parade, we made up time as I tested the little Jazz’s acceleration and high-speed manners on the motorway. We quickly caught up and passed some of the electric cars, most of which were wafting along well below 70mph to conserve battery power. 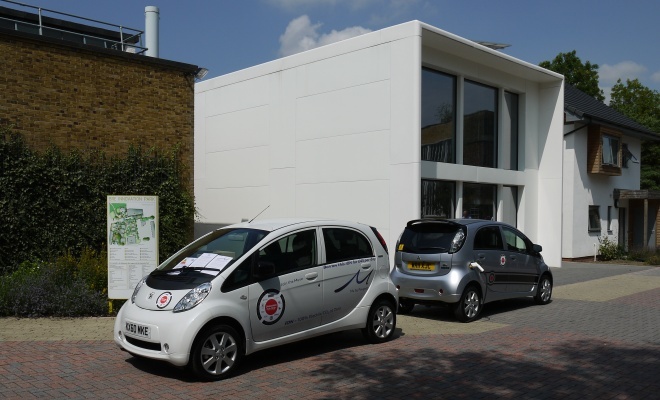 The BRE Innovation Centre made for a fascinating stopover. A collection of different show homes have been built to demonstrate a wide variety of approaches to reducing household energy demands. The site is well worth visiting if you’re interested in greener living. After lunch and going all around the houses, so to speak, it was time to depart again. Sadly, the haziness of the morning had failed to resolve into a sharp plan of action. Celebrity driver and former pin-up Samantha Fox was due to leave by Peugeot 308CC e-HDI, apparently, but for a slight hiccup. She could only drive automatics, and the drop-top Pug was resolutely stick shift. My two-pedal Jazz was promptly commandeered. Ms Fox grumbled loudly that the humble Jazz wasn’t the kind of car she wanted to be seen driving. 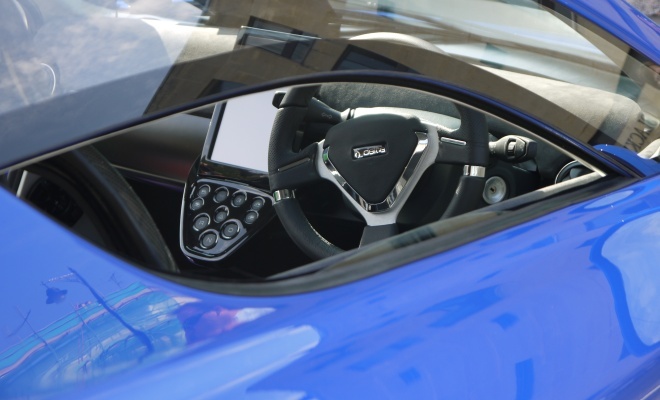 Given the lack of alternatives, she was forced to put up with it, electing to distract attention from the Honda’s unremarkable body by drawing attention to her own – taping a bright purple bra to the driver-side door mirror. The now vacant Peugeot failed to come my way. There were murmurings of a ride in the Volvo C30 EV, until it transpired that there’d been an issue with overnight charging and it was staying put, hooked up to the mains until the range gauge had acquired sufficient kilometres to get to The Mall. I was told to wait, and there’d be a seat in something else soon enough. Perhaps I should have grumbled more loudly myself, because eventually the car park was empty save for the coach carrying support staff. So that was the second leg of my Eco-Rally – a seat in the back of a 56-seater. 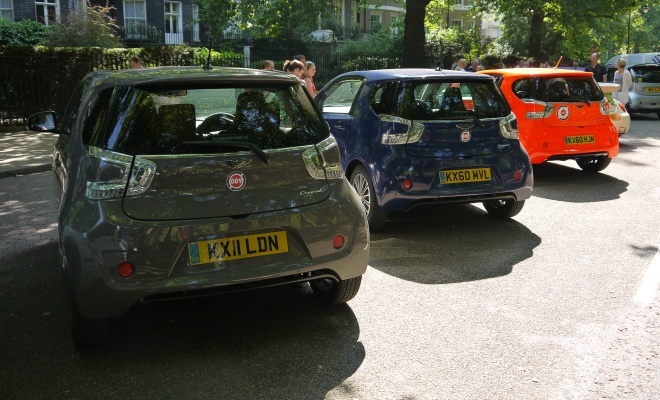 Rally organiser Steven Glazer was apologetic, but it was pretty clear where GreenMotor.co.uk fitted on his list of priorities – not on the list at all. Still, it had been fun up until that point and at least the coach trip allowed me to grab 40 winks after my 6am start. The event will be back next year, and so will I – no doubt relegated to spectating again. With which I’m quite happy. The cars will roll into London in the afternoon, and I’ll be able to enjoy my Sunday morning lie-in. 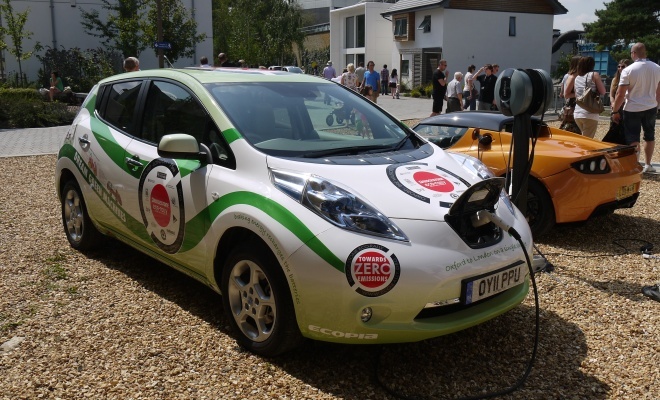 Before the Eco-Rally returns, however, there’s the next Brighton-to-London Future Car Challenge to look forward to, on 5 November. 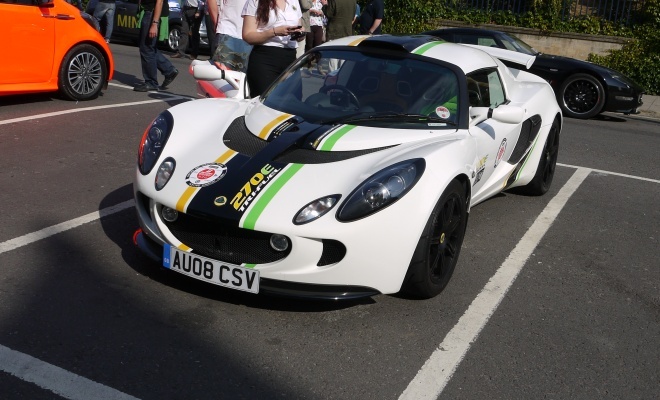 It’s a much higher profile event and tends to attract a wider range of cars, so it’s really worth marking your diary now and going out to cheer on the drivers. And if any of the entrants happen to be shorthanded, I’d be happy to drive. Even if it is only half way.